For decades the Ministry of Defence kept what it knew about UFOs locked away in its archives. Now, the contents of what have been called Britain's X-Files are finally being revealed. One of the UK's leading UFO experts told Radio 4's Today programme about his hunt. The first eight of 160 MoD UFO files have been opened at the National Archives, thanks to the Freedom of Information Act. 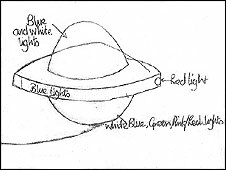 They contain details of thousands of sightings of strange lights and objects in the sky from 1981 to the present day. Most of the sightings were made by ordinary people, including police officers, pilots and schoolchildren. But, now the X-files have been opened, what do they actually tell us? The answer is disappointing for those who believe the British government has been concealing evidence of visits by aliens. As I leafed through hundreds of official UFO report forms it became obvious the vast majority of sightings could easily be explained. For example, staff and customers at a pub in Tunbridge Wells reported seeing a UFO with "red and green flashing lights" moving across the sky. When asked to describe the direction of movement their answer was "Gatwick". Aircraft, bright stars and planets, satellites and space debris all stand out as the most common explanation for UFO reports. A small number have been revealed as hoaxes or hallucinations. But a hard-core of 5-10% continues to defy explanation. Despite the mystery that continues to surround those that remain "unidentified", the papers reveal how little time and effort was spent by the MoD to investigate them. Even those reported by RAF pilots and civil aircrew were rarely investigated further. 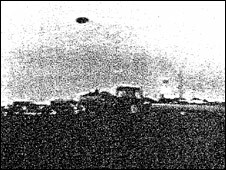 This lack of interest was justified by officials on the grounds that the MoD was only allowed to determine whether UFO sightings were a threat to defence. During the Cold War the major threat came from behind the Iron Curtain, not from outer space. Meanwhile, public fascination for UFOs has continued to grow. In 1999, a survey for the Daily Mail found that 49% of the UK population believe that life exists on other planets and 29% believe that aliens had already visited Earth in flying saucers. Equally popular is the idea that governments of the world are conspiring to conceal evidence of alien visits from the general public. 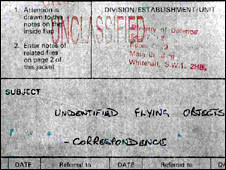 Secrecy provides a breeding ground for conspiracy theories and the MoD's policy of playing down the subject encouraged some people to believe that proof of UFO reality was being deliberately covered up to prevent panic. I was determined to discover if there was any truth behind these claims by using investigative techniques to uncover the facts. From 1994, it was possible to obtain copies of government papers from the previous 30 years, and I began using this power to request copies of MoD files on famous UFO incidents. In 2001 the MoD agreed to send me papers they held on the Rendlesham Forest incident - known as Britain's Roswell. This was the first breakthrough in what became a 10-year campaign for full disclosure of British government papers on UFOs. When the Freedom of Information Act arrived in 2005, the MoD was overwhelmed with requests for information. It soon emerged that UFOs were among the top three most popular topics. Working with a small group of colleagues, I embarked on a targeted strategy using FOI requests to cajole, persuade and - when necessary - force the MoD and other government departments to reveal what they knew. This ultimately led to the decision, last year, to transfer the entire collection of UFO files held by Whitehall to the National Archives at Kew. The files will be released in chronological order over a four year period and made available to the public to download free of charge for the first month. The papers contain details of 8,000 sightings from 1981 to present. The names and addresses of those who reported sightings to the MoD have been removed to protect their identities. In a statement released to us, the MoD conceded that "by opening our files in this way, we may help to counter the maze of rumour and frequently ill-informed speculation that surrounds the role of the MoD in the UFO phenomena". Conspiracy theories are very difficult to disprove. I doubt the disclosure of these files will convince those who believe there is an official cover-up. Inevitably, some have already dismissed this release as a whitewash. For them the 'truth' still remains out there, hidden no doubt in more top secret files hidden somewhere else.